If you've recently lost your teeth and received an immediate denture, it's normal to find some tissue shrinkage and bone loss occurring. Therefore, in several months you may find that your immediate dentures no longer fit well. You will have two choices at this point: You can have your immediate (temporary) dentures re-lined. This means that material is added under the denture's base to better conform to the new contours of your alveolar ridge. 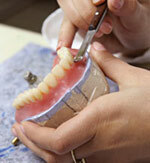 A better option is to move to a set of conventional full dentures, which will last longer and fit better. You don't have to make this decision alone, our staff will discuss all alternatives so we can weigh the options in order to make the best decision for your smile. With proper care, dentures offer a functional, aesthetic and economical solution to the problem of tooth loss. We will discuss proper denture care at the end of the procedure. Call Carmel Commons Dental in Charlotte, NC today at (704) 540-2443 to schedule an appointment!